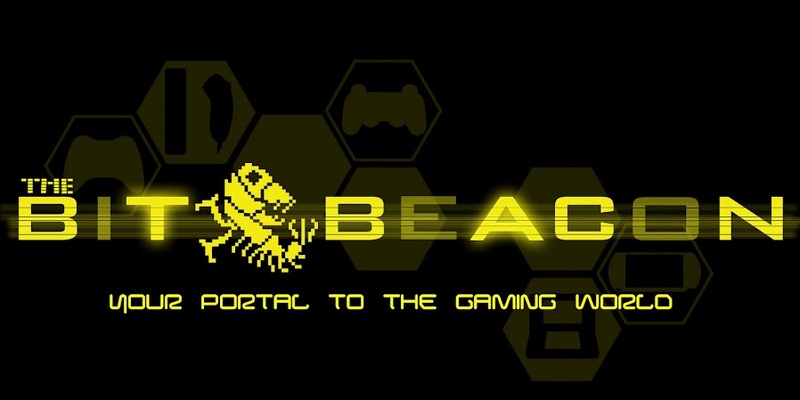 The Bit Beacon: A Look Back At Pac-Man 2: The New Adventures! A Look Back At Pac-Man 2: The New Adventures! Everyone remembers Pac-Man. Who doesn't? Since 1980, he has been considered one of the god fathers of the art medium called 'video games.' His name has become almost synonymous with the term, and has been made into a symbol of the overall pop culture in the 1980's. As the first original mascot of any video game, this arcade superstar's classic debut has become such an awareness, that it holds an exhibit at the Smithsonian in D.C. Some of us may even remember the character's cartoon TV series. While reminiscing, we remember what the gameplay experience was like. And we remember the later, somewhat controversial, Ms. Pac-Man, which was not in fact, originally licensed by Namco. In addition the extensive main series from the mind of Tōru Iwatani, our world has known a plentiful abundance of both licensed and unlicensed spin-off titles. Among the first were Ms. Pac-Man, Jr. Pac-Man, Baby Pac-Man, and Professor Pac-Man. Long after many more had hit the market, we saw an arcade title that also released on the NES, Atari Lynx and a number of home computers called Pac-Land. 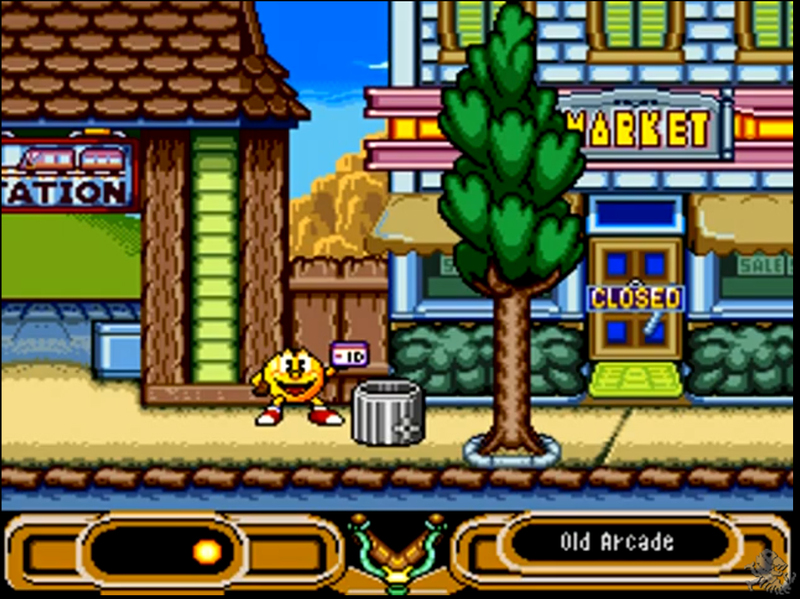 The gameplay was not of the classic Pac-Man format, but was instead a side scroll adventure. This came to be the inspiration for a later game on the Genesis and Super NES called Pac-Man 2: The New Adventures. Two types of 'vehicle modes' are presented in the game as well. In one area, our star rides a hang-glider, which is mandatory for completing the second task. And there are two, sort of hidden, instances where Pac-Man takes a mine cart ride, which are not mandatory, but drop you off at opposite sides of the map. During these modes, your goal is to protect Pac-Man as he rides, by constantly sniping down ghosts (the only time when the slingshot has an effect on them) and keeping him from crashing. When riding either the mine cart or the hang-glider, the function of the 'look button' changes. 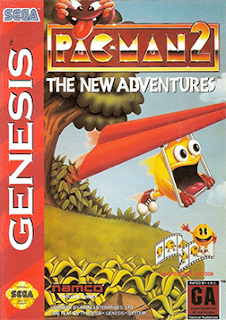 While hang-gliding, it tells Pac-Man to ascend higher, and in the mine cart , it tells him to pump faster. Alternatively, shooting Pac-Man during these times causes him to descend or pop up high above the cart, avoiding certain traps. 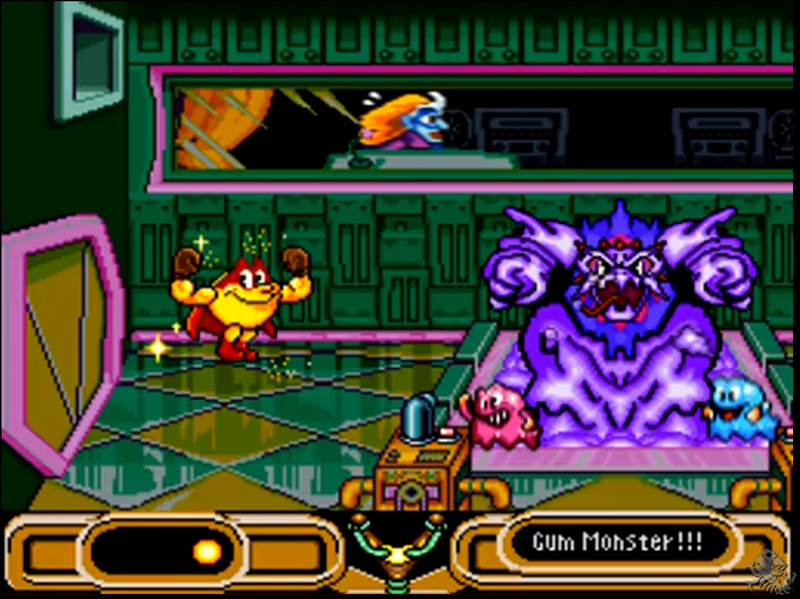 The only combat-oriented part of the game is a showdown with the Gum Monster at the end. 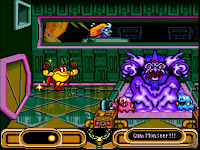 This battle is fought by constantly feeding Pac-Man super pellets in order keep him Super Pac-Man as much as possible, who cannot be attacked by the monster, then blasting away at its face with the slingshot. 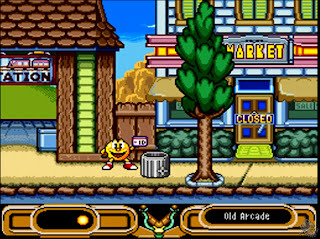 Failure occurs if the character is cornered as ordinary Pac-Man, resulting in the battle starting over. 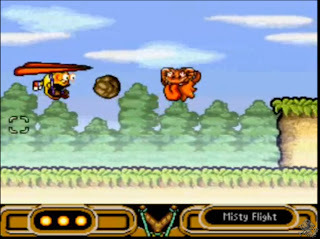 Super pellets are frequently made obtainable throughout the battle. Pac-Man has no health or life limit. If a failure occurs, the player simply tries again at the beginning of the current area. Thus, there are no “game overs.” The game is also very notable for its lovable humor in such failures. The title received mixed review from a number of critics. For me personally, I love this game and still play it today. I definitely recommend giving it a try due to it's unique mechanical setup and fun gameplay. It still makes me laugh! Feel free to leave comments, and join us next month as we take a look back at a PlayStation favorite!